With VMworld done, let's see how VMware has managed to find its footing with OpenStack's falling short in the past year. I used to be sure OpenStack would take over VMware. Five years ago, when I worked on OpenStack, I felt freedom – users could manage the entire cluster as a cloud and say goodbye to $5,000 fees per license. However, in hindsight, VMware hasn’t been cannibalized by OpenStack or by the public cloud. VMware is now increasing revenues, while OpenStack fades away. VMware adopted OpenStack APIs, kept the orchestration story and added in the battle-tested VMware stack. So how did VMWare grow despite the massive transition to the public cloud, open source adoption, and new container technologies making hypervisors redundant? It’s actually quite simple: most IT organizations are not ready for a true digital transformation. They struggle to keep the lights on due to a myriad of legacy applications, Oracles, and SAPs to manage. VMware, Azure Stack, and Nutanix are the only integrated solutions for IT automation, as opposed to DIY and OpenStack solutions that require skilled DevOps, pro-services, and can’t appropriately address business requirements. The Pivotal Container Service announcements make everyone happy. VMware will ride the cloud-native story, Pivotal embraces Kubernetes so it doesn’t hurt the rumored IPO and Google can access more enterprise customers. Surprisingly enough, this major VMworld announcement doesn’t include any new technologies from VMware. Pivotal and Google did most of the work. At VMworld this past week, VMware announced several new solutions, but no real technology breakthroughs, whereas AWS re-INVENT showcases dozens of completely new services every year and keeps adding higher level applications to the stack. VMware Cloud Foundation is VMware’s latest answer to Azure Stack and even snatched Azure’s “consistency” slogan. However, there are a few differences: VMware provides infrastructure virtualization and automation, while Microsoft talks about services, dev tools, databases, serverless functions and sealed hardware. Like in a real cloud, there’s not much for IT to play with. 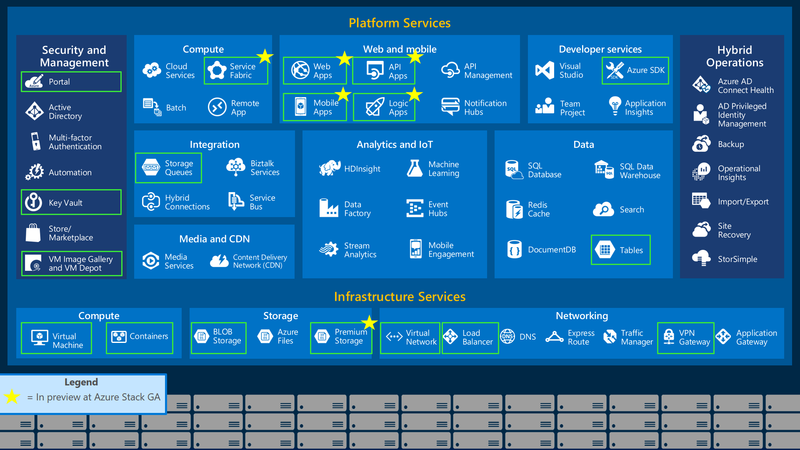 It’s not all rosy at Microsoft either, as it pitches “consistency” while Azure Stack provides only 20% of Azure Cloud’s functionality (see the green boxes in this diagram). At least Microsoft has a plan to get there. Until then, iguazio is probably the only real “consistent” platform with exactly the same cloud, data, analytics, and serverless services at the edge, on-premises, or in the cloud. The crown jewels seem to be NSX and security, driven by the transition to cloud. Network services and their security become critical as we start moving workloads across hybrid and multi clouds, increasing mobile workforce access and addressing IoT. NSX, AppDefense and Network Insight address hybrid world needs and will become core products as the hypervisor value proposition makes room for public cloud and container technologies. To conclude, VMware is doing well. Its “mojo” is back, but it still seems to be focused on legacy infrastructure automation without innovating fast enough. Maybe it’s okay, since legacy IT won’t go away, but it’s not a long-term growth strategy and VMware needs to figure that one out quickly before its customers move from Virtual Servers to Server-LESS. Published at DZone with permission of Yaron Haviv , DZone MVB. See the original article here.